Most renters expect a refund on their security deposit when they move out of their apartment (save for those who have completely trashed the place). But a hefty percentage of renters aren't getting their money back. 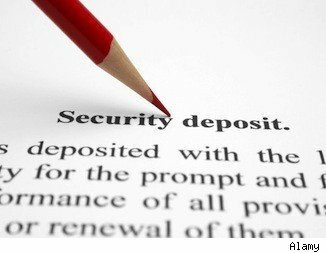 More than a quarter -- 26 percent -- of renters have been denied their security deposits, a Rent.com survey found. The biggest reason for landlords withholding security deposits was a tenant moving out early, according to the survey. Almost half -- 44 percent -- of renters ages 18 to 24 and 33 percent of men who responded to the survey cited breaking the lease agreement as the reason they didn't get their security deposits back. Nine percent of women and 3 percent of men in the survey of 1,000 respondents said that they lost their security deposits because of pet damage. But the most alarming statistic: 36 percent of respondents said that their landlords offered no explanation at all for why they were withholding security deposits. Well, guess what: That's not always legal. In New York, for example, landlords are required to return security deposits, minus any legal deductions, within a certain period of time. In California, there are only four reasons why a landlord may withhold a security deposit: to cover unpaid rent, to clean the rental when a tenant moves out, to repair damages caused by the renter, or to replace furnishings (only if the lease agreement explicitly states that this is allowable). And a landlord must state the reason to the renter for why his or her security deposit is being withheld. Landlord.com has a list of security deposit laws in all 50 states to help you find the rules where you live. Ask for permission to renovate. If you renovate or add on to an apartment you are renting without getting permission from your landlord first, that gives them cause to withhold your security deposit. You may think that you are improving your unit, but your landlord may not see it that way. Remember, they own the place, not you. Read your lease. Most lease agreements lay out specific requirements that need to be met in order for the tenant to get a security deposit refund on move-out day. You can't claim that you didn't know about the requirements. Make sure you read over the lease and agree to the conditions of a security deposit refund before you sign on the dotted line. Ignorance is not a defense. Take photos. Pull out your camera and take photos of your apartment the day you move in. This will give you proof of what condition the apartment was in when you moved in. On move-out day, have the photos accessible so that you can lay to rest any disputes over damage that may or may not have been caused by you. Be ready to compromise. If you're breaking your lease agreement, work with your landlord to resolve the matter. You could offer to find a replacement tenant or keep paying the rent until one is found. The landlord will likely appreciate your efforts to make it easy for them, and he or she may be more likely to refund your deposit.